The Academy Cougars beat the top seed JFK Islanders in the fourth round of the playoffs, in an exciting battle Wednesday evening. The final score was 12-9 in favor of Academy, with JFK suffering just their second loss all season. The Cougars proved the only team to best JFK after the Cougars busted an unbeaten streak the Islanders had in the regular season. This game was a defensive battle going into the bottom of the second inning, neither of them scoring a single run, as both defenses were merciless from outstanding fielding skills and pitching from Pillar George and Ashley Mendiola. JFK got heated in the bottom half of the second inning, earning a total of five runs. The first run was an RBI single hit by Gabby Bengko, giving the clear to Erynn Blaz. 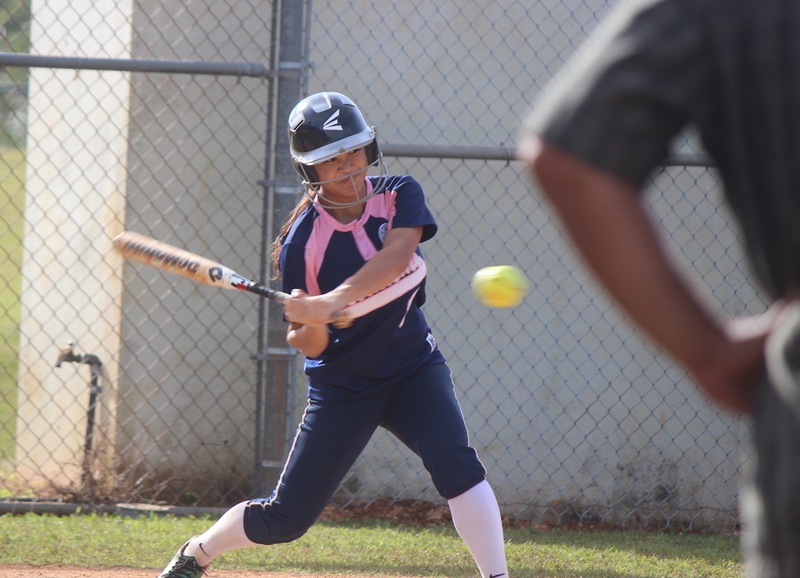 The next four runs were scored when Isabel Itliong-Cruz hit a bomb. The bases were cleared when the Cougar shortstop Doriaun Clavo made a critical defensive error, allowing JFK to clear the bases for four runs to put AOLG down a quick 5-0 hole. Calvo managed to turn her game around in a big way, which the Cougars proved to need. The whole third inning was another hitless span of time, the only time a runner was on base during this time was when Erynn Blaz was walked by the Academy pitcher, Ashley Mendiola. It was the top of the fourth inning when the Cougars started to make some noise. An impressive six runs were scored by the offense. The first run came from an RBI single hit by Kristiana Cruz, giving a run to Dorian Calvo. The next two runs were hit by Isabella Muna, an RBI double. The last three runs came from an RBI triple, which almost became an in the park grand slam. The score was now 6-5, Academy barely edging JFK. Wendy’s Players of the Game Kristiana Cruz and Doriaun Calvo. The Islanders answered that offensive surge with three of their own runs, both from RBI doubles from Narissa Blaz and Olivia Iriarte. These three runs gave the Islanders an 8-6 lead. In the top of the fifth inning, the Cougars earned only one run. This lone run came from an RBI single hit by Aubrienne Esplana, letting Juliana Nelson take home. This narrowed the score to 8-7. In between the fifth and sixth inning, there was a short rain delay. In the top of the sixth inning, the cougars took the game and ran with it, scoring four runs. These runs came from 2 RBI triples, both were hit by Dorian Calvo and Kristian Cruz. The other run was scored was punched in when Kristiana Cruz stole home after a wild pitch from Pillar George. The score was now 11-8, Cougars on top. In the top of the seventh, Academy’s Kiana Rivera hit a solo in the park homer, making the score 12-8. In the bottom of the seventh, JFK’s last chance to shine, Pillar George Bombed a pitch deep left field, only to land on the ground a few feet from the fence. This caused an RBI triple. Kristiana and Doriaun both earned player of the game for their offensive accomplishments. Kristiana Cruz hit three RBIs and stole home. Dorian Calvo hit an RBI and a triple, and was great on the defense. The Cougars will now head to the championship game in which they have to lose twice to lose the title. The final score of the game was 12-9.